Now that I've been using GitHub for more than a year for most of my personal (and some commisioned) projects, I think I feel comfortable enough to explain the Git basics and why it simplifies a lot of things if you are a developer. On September, I moved to New York and I couldn't bring my Desktop PC with me. I needed a PC to work so I bought an Asus laptop. Because I had being using GitHub to save all my projects, I could easily import all the projects with some commands that I will tell you later. GitHub also serves as a backup for all your code. If your PC goes in fire, you will still have your code saved in GitHub's servers (but you will have to expend some money on a new PC :dollar:). Collaboration is the key. If you have some public projects, you can let people collaborate with you. You don't expect people to fix issues and add features for you if your code isn't public or shareable, and that's one fundamental feature of Git. Free if you are an student: I didn't wanted to pay for a GitHub account at first (I would right now), but when I heard that they give free licenses to students I just rushed to get an account. You can get yours here. That's it! You now have your code backed up online available to all the developer community (if your repo is public). GitHub isn't only about files full of code, you also get issue management, where you can file all your nasty bugs and have a thread for each one; Pull requests, a way for others to make changes to your code; and much more! GitHub also offers an API that, for example, I have already integrated with the Lab page, where you can see all the latest commits for all my public projects. You can see all the cool features you get at https://github.com/features. I hope you liked the way I currently work and you start using it in your own projects. GitHub is the easiest way to backup your code online although there are other alternatives such as GitLab and BitBucket. 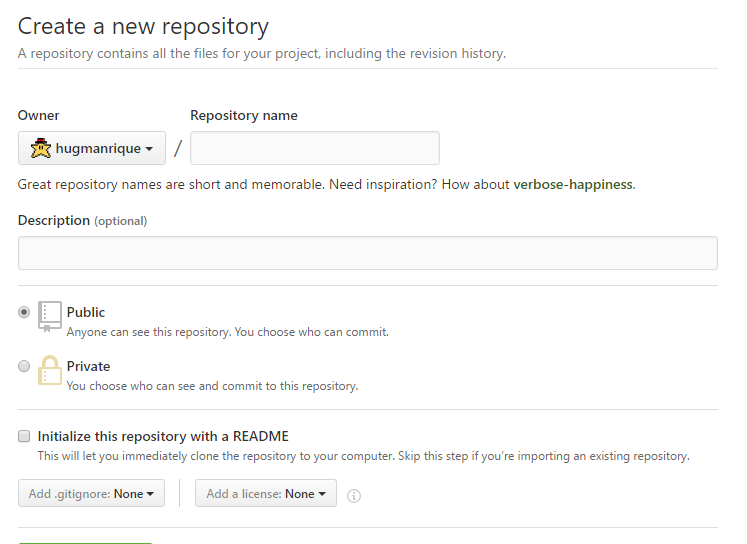 Today, we learnt how to create our first repository and how to push your changes online. You can contact me if you have other doubts.